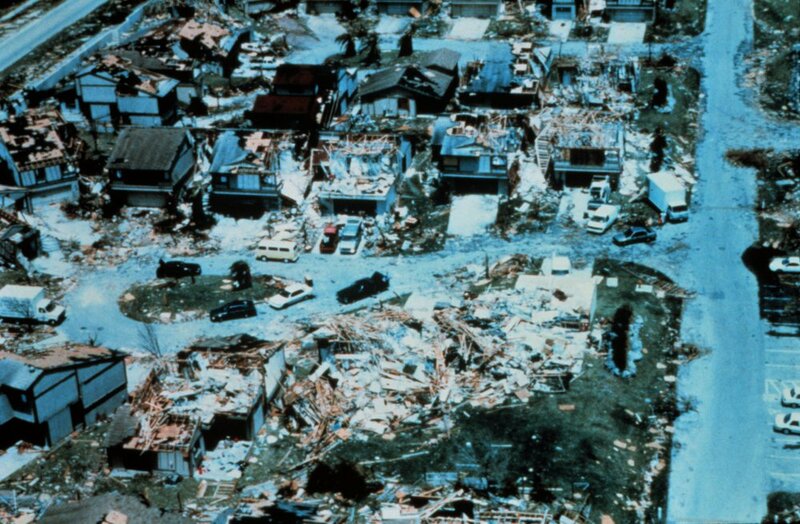 Hurricane Testing Revealed — HENSELSTONE WINDOW AND DOOR SYSTEMS INC.
Hurricane Andrew hit the coast of South Florida in the early morning hours of August 24, 1992. The category 5 storm with wind speeds in excess of 150 mph caused billions of dollars of damages. Experts who analyzed the destruction decided quickly that the building codes on Florida were out dated and a lot of damage could have been avoided. Dade County administrators were the first to look into strengthening building codes. The first thing that was need was a realistic simulation of what happens when a hurricane moves through a building. Hence the "Dade County Test." Of course Dade County was not the first entity to look into this. Scientists in Australia had developed testing standards for all kinds of building materials in a simulated lab environment. Design Pressure rating. The glass cannot come out of the frames or show any openings larger than 2 inches. Henselstone's standard Design Pressure rating for all windows and doors is 65 psf positive and negative. All impact rated products pass the large missile impact test for wind zones up to 140 mph (missile D). The results are measurable. Since 1992 more and more municipalities and counties have mandated hurricane tested building materials and a conforming construction process. In 2005 Hurricane Wilma allowed for a first time to make scientific comparisons. This storm hit southern Florida from the west, an area of Florida not as densely populated as the east. However, surveys of neighborhoods showed a significant reduction in damage to buildings in residential neighborhoods that had been built under the new building codes. These findings for the first time confirmed that the theoretical environment where building materials are subjected to impact, pressure and suction do relate to better performance in the field.